From the east (Page, AZ) or the south (Fredonia, AZ) of Kanab - go north on highway 89 . As the road curves to the left, the Parry Lodge can be seen on the right. Make a right turn at the street just before the Parry Lodge and then right into the parking area. The museum is located in the historic building that once housed the library. You can still see the "Library" sign above the door. From the north, Mt. Carnal, Zion, Bryce) drive south on highway 89 to Kanab, in town, turn left on 100 East, immediately turn right into parking lot. 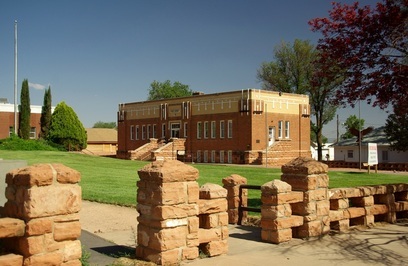 Museum is on south side of parking lot, in the old Kanab Library building. Hours: Monday - Friday, 9;00 am - 7:00pm ; Saturday,1 :00 am - 7:00 pm; May 1st - September 30th.